The shopping basket used on this website is provided by Ravelry, and Ravelry coupon codes and discounts are generally applicable here with the exception of single use codes. You do not need to be a Ravelry member to buy patterns here, the download links will be sent to your PayPal email address. If you are a member, you will be given the opportunity to add the items to your library. Members of The Woolly Hat Society are generally the first to know of any discounts and promotions, and most promotions are exclusive to subscribers. If you wish to be kept up to date with special offers, subscribing is recommended. If you're unsure how to use the coupon/discount codes with the shopping basket, this page will guide you through the process. The coupon/discount code must be used with the shopping basket before proceeding to the PayPal checkout - the codes provided cannot be used with PayPal. Please note that all sales and promotions start and finish by Italian time, CET. Please scroll down for information about Single Use Codes, Bundle Promotions, Adding Items to Your Ravelry Library or Problems with Promotions. When you have finished making your selections, click on the view basket button at the top of the sidebar to see the items in your basket. Towards the bottom of the basket, and to the right of the checkout now button you will see the use a coupon code text - click on this. Add the coupon code to that box and click apply. The discount or promotion will automatically be applied to the relevant items in your shopping cart. Then checkout as normal and proceed to PayPal to make your payment. These are generally only available to use on this website, not Ravelry. That’s because although I use a Ravelry cart on this website, it’s a completely separate shop to the one on Ravelry, and single use codes cannot work in both. If in doubt check the details that are supplied with the code, which is usually a postcard. Nearly every person that emails me to say the code isn’t working has been trying to use it on the wrong website, so please ensure you are following the directions given with the code. These codes are single use codes and can only be used once, so any failed attempts to use the code could result in it being voided, and I no longer send out replacement codes - use your code with care! This is a new feature, and it means that when you buy an eBook from me you also get the single patterns that go with it for the same price. It also means that if you buy a single pattern then decide to purchase en eBook, you get a discount to the value of the amount you’ve spent. The promotion is based on how much you have spent, not the listed cost of the item. So if you’ve bought a single pattern on promotion, you will get the exact amount you paid back as a discount. The total amount you’ll be required to pay, i.e. the value of the promotion, is the cost of the eBook that the bundle relates to. This means that you can get all of the single patterns available from an eBook and the eBook itself for the price of that particular eBook. You will need to go through the procedure of ‘buying’ all of the items for the promotion to work. So if you want those single patterns, you will need to add them to your basket to initiate the promotion. That said, they don’t all have to be added to the cart at the same time; you can purchase them at different times. However, as prices increase over time, so does the total cost of the bundle promotion, so you are advised to purchase them sooner rather than later. You will need to shop within the same shop for the system to correctly recognise how much you have spent! So if you have purchased some patterns from Ravelry, please go back to Ravelry so purchase the remaining items. 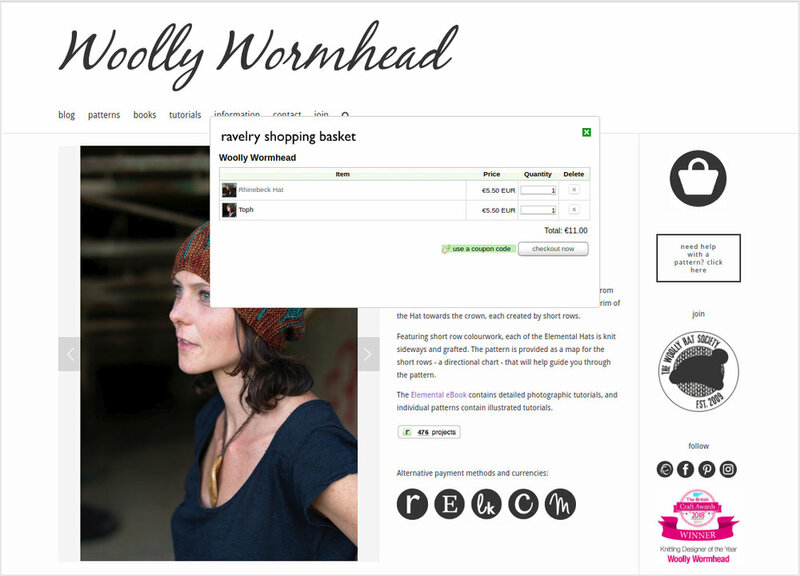 The system invariably does recognise amounts spent but it would require you to be logged into Ravelry in a separate tab if you purchase from the website, and the exchange rates could also work against you. You are advised to be logged into Ravelry in a separate tab when purchasing from this website - this should trigger the pattern delivery to recognise your account and add it for you. If you aren’t logged in then your download email should include a link to add the item to your Ravelry library. If it doesn’t there isn’t much I can do, but Ravelry staff may be able to help you (they manage the back-end technical side of things - I can’t help with delivery or download issues). These do occur sometimes, but rarely. We have learnt that some devices or some device+browser combos don’t apply the codes. We don’t know why, but there has been some discussion about this issue in my Ravelry group and this thread contains lots of advice. If you are experiencing problems, please post in that thread first. The best advice would be to clear your cookies, try a different device or browser. We know that desktops work better than tablets, in general. This page has been provided to help you make the most of the promotions as they occur. Please note that we cannot offer partial refunds if the code is missed or unused, or if you later find a discount for an item you have previously purchased. Please also note that unless otherwise stated, a coupon code will only be applicable to a specific item or purchase as outlined in the newsletter, and cannot be redeemed against other patterns or books.